1. Offers that include shipping charge discounts, gift with purchase, services, financing, bundling of items, free items, pricing errors, “Misprinted”, mail-in offers and online only offers. 3. Advertisements that require a purchase to receive the advertised price or free product. When can I expect to receive my order if shipped? We understand that getting your product(s) in a timely manner is very important to you, which is why we make every effort to expedite your order at no additional charge. Estimated delivery times are typically 2-10 business days after your order has been processed depending on which warehouse we ship from as well as the state and location being delivered to. Because of the high volume of orders during the holidays, there may be some delays. As some unforeseen events may occur, we can make no guarantees on the exact delivery time and date. There may also be delays due to road and weather conditions depending on the area that the order will be delivered. Depending on the type of truck being used to delivery your vehicle, the freight company may request that you pick up your items from the local terminal, this typically only occurs if the access roads have weight restrictions or the delivery truck is unable to safely maneuver in or around the delivery location. Unfortunately, these occurrences are unforeseen and cannot be avoided, therefore, shipping cost cannot be discounted or refunded. Is there any assembly required for shipped items? Items will be shipped in a crate 80-95% assembled. You are responsible for performing the setup that a dealer would normally perform – such as putting on rear mirrors, trunk, charging the battery, hooking up the battery, checking tightness of all nuts and bolts, checking all fuel line / hose connections, changing oil, checking spark plug, etc. Occasionally some units may need other routine items checked/adjusted such as adjusting the carburetor idle and mixture screws, checking to ensure wires are well connected, adjusting chain slack, alignment, and clutch, if needed. For safety precautions, be sure to check and tighten all nuts and bolts prior to use and use Loctite if you need to. Be sure to check for appropriate engine fluid levels to ensure your vehicle is operating under the recommended conditions prior to use. We highly recommend having your unit assembled and tuned by a certified mechanic to make sure everything is done properly. If you choose to do the assembly yourself and have a question or cannot get your unit started, please call us toll FREE 1-888-791-8149. We will not accept returns simply because you do not understand how to assemble the unit you ordered, we will assist as much as possible but for us to assist you, you must be willing to follow our directions or take the unit to a local mechanic. It is the sole responsibility of the Purchaser to stay informed and educated with new safety courses, material, product recalls, products safety and instruction information, including updates. These materials are, when available, can be found at the manufacturer of the products website. 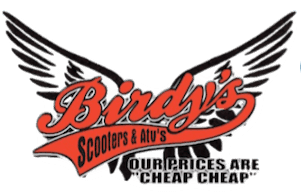 Birdys Scooters and ATVs LLC is not responsible for obtaining, communicating, or notifying the customer of this information in any capacity. Does Birdy's Scooters & ATV's have layaway? We offer free layaway on most of our items depending on availability. An initial down payment no less than One Hundred Dollars ($100) will be required to start a layaway. All layaway payments are non-refundable. If the customer decides they no longer want the item in layaway they may change to a different item that cost no less than the current amount paid up to that point. Due to limited space, we may have to re-order the specific make / model that the customer requests to be put in layaway. We will not hold a specific VIN for any duration of time. To ensure your item is ready for pickup upon final payment, please try to notify us 24 hours prior to your arrival. You must contact us within 7 days of your receipt of the item to receive a Returned Materials Authorization (RMA) number. The RMA number must appear prominently on the outside of the packaging. You will be responsible for the initial shipping freight charge, the return freight charge and also a 35% restocking fee to cover the time, labor and materials invested in preparing the shipment. If you decide to return a product that you purchased that had a promotion of free shipping, then the original shipping costs of that product will be charged to you and deducted from the returned fees. All assembly and registration costs are non-refundable. Due to hygienic reasons, we do not accept returns of any helmets. Returned products must be received in 100% new, re-sellable condition. A product is not eligible for refund if it has been ridden, worn, used, abused or damaged in any way. The product must arrive complete (including warranty cards, manuals, accessories, promotional items, etc.) and in the original packaging. A copy of your original invoice must be included in the return shipment. Only after an inspection of the returned product, a refund check will be issued and mailed to you within 2-3 weeks of receipt. You must meet all the foregoing terms to qualify for a refund. EXCEPT AS SET FORTH IN OUR CANCELLATION POLICY AND RETURN POLICY, ALL SALES ARE FINAL AND ABSOLUTELY NO REFUNDS ARE PROVIDED. FOR PARTS COVERED BY WARRANTY, SEE OUR LIMITED WARRANTY TERMS. FREIGHT COLLECT AND COD DELIVERIES WILL NOT BE ACCEPTED. In order to cancel an order, you must contact us within 24 hours after the order is placed. If the order has been processed but not shipped then you will be charged a non-negotiable non-refundable cancellation fee of $50.00. If an order has been shipped, then the order may not be cancelled and is covered by our Return Policy. What do I do if my item arrives damaged from shipping? Before your order is shipped it is securely packaged to avoid any damages during transit. Once your order is delivered, please take the time to inspect the unit before the delivery driver leaves. If there are any minor damages to the unit, not the frame protecting the unit, please notate that on your delivery receipt (proof of delivery) AND contact us at 888-791-8149 for assistance. Please take photos and email them to birdysscootersandatvs@gmail.com to file a claim. Any delivered orders without any notations on the delivery receipt of damages indicates you have received and accepted your order in good condition. If the unit, not the frame protecting the unit, is severely damaged please call 888-791-8149 to report this issue immediately. We will notify you to refuse delivery of the unit and to notate “refused due to damages” on the delivery receipt. We will process a replacement unit to be shipped out to you. If you refuse the unit without this noted, we cannot file a claim for you. Please understand that you must follow these guidelines to have your claim approved. Any requests for a damage claim without the above will not be accepted. Is there a warranty on my items? What is the process to begin a warranty claim? To begin warranty claim, please refer to your original order with a description of what you need and the best time to reach you. All claims must be made in writing. You may also email us at birdysscootersandatvs@gmail.com. The defective warranty part(s) are required by the manufacturer to be returned to us and exchanged for new replacement part(s). *Note only the defective part(s) will be replaced and not the complete vehicle. Returning your defective part(s) will ensure we send you the correct part(s) and assist us in monitoring and correcting potential manufacture defects. In some instances, we may require a professional mechanic to provide us with their diagnosis before we replace certain parts under warranty. You may seek a professional opinion prior to requesting replacement parts if you are unable to assist us in troubleshooting your issue over the phone. Many times, issues are quickly resolved in just a couple of minutes if you know what to look for. Your continued satisfaction is extremely important to us, so we process all claims as quickly as possible in hopes that your unit is up and running again as soon as possible. If we do not have the part you need readily available at our store or local warehouse, we will order it, sometimes parts must be shipped across seas. If this occurs, we will do our best to keep you informed, however, we can only provide you with the information we are provided from the manufacturer. Please keep in mind that threatening our workers, making demands, and yelling will not make the factory produce parts or ship parts any quicker.